Motorcycle accidents are tragically commonplace due to the motorcyclist’s lack of visibility. If you are involved in a motorcycle accident, you are likely to be injured, stressed and shocked following the accident. You may do or say things that are not helpful in the long run towards accomplishing recovery from your accident. 1. Do not leave the scene of the accident – Under Mississippi law, you cannot flee the scene of the accident and doing so can result in criminal charges. You should be sure you are sufficiently out of the way of other vehicles and safe from any further collisions. 2. Do not forget to file a police report – It is best to call the police as soon as possible after the accident, even if no one appears injured. A police report can prove crucial towards your later recovery. Officers will typically respond quickly to the call. If for some reason you do not obtain a police report at the scene of the accident, go to the police station and complete an accident report as soon as possible. Never simply exchange insurance information with the driver of the vehicle or other motorcycle—you need that police report. 3. Do not admit fault – Do not, under any circumstances, admit fault to the accident. You have just been in a traumatic event. You need time to process the incident, and statements you make while under the stress of the accident may not be accurate. Therefore, do not make any statements concerning liability. Statements you make now can impact your later recovery. 4. Do not refuse or delay medical attention – injuries following motorcycle accidents tend to be more severe than those from car accidents due to less protection on a bike. Many injuries following a motorcycle accident may not manifest for several hours following the accident. It is best to seek medical attention immediately following the accident or as soon as possible afterwards. The longer you wait the more room you give for the insurance company to argue your injuries were not caused by the motorcycle accident. 5. Do not delay consulting with a knowledgeable Mississippi motorcycle accident attorney – Crucial evidence can be lost during the immediate aftermath of the accident if you do not act quickly to secure representation. A skilled motorcycle accident attorney can advise you on the steps you need to take to obtain full compensation for your motorcycle accident injuries. So before you speak to any insurance adjuster, consult with a professional motorcycle accident attorney. The Giddens Law Firm, P.A. has handled countless motorcycle accident cases in the Jackson, Mississippi area. We have the knowledge and resources necessary to expertly handle your motorcycle accident case, regardless of how challenging or complex. The Giddens Law Firm operates on a contingency fee basis and the first consultation is always free. Call us today at 601-355-2022 to learn more about your legal options! Mississippi’s miles of endless highway make it an ideal spot for motorcycle enthusiasts. However, along with the popularity of this mode of transportation comes a high risk of harm. Motorcycle accidents can lead to serious injury because of the lack of structural protection afforded motorcyclists, as compared to drivers of motor vehicles. Over 100,000 U.S. motorcycles a year are involved in crashes and more than 4,500 fatalities result. Given the high rate of deaths and severe injuries, motorcycle accident victims and their families often require the assistance of a personal injury attorney to pursue a personal injury or wrongful death suit. The following are some of the most frequent questions posed by motorcycle accident victims and their families. Those with further questions are invited to contact us to schedule a consultation. Are all motorcycle accidents in Mississippi caused by driver error? No, not all accidents are a result of driver error. Sometimes, motorcycle collisions in our state are a result of equipment failure, defective roadways, or defective motorcycles. When these sort of accidents arise, the manufacturer of the motorcycle may be liable for the injuries caused by the defective motorcycle. Further, those responsible for the defective roadway may be liable under premises liability law. What types of compensation are available to those in Mississippi injured in a motorcycle accident? It may be possible to additionally seek punitive damages if the other driver’s conduct was particularly egregious; such when the accident results from the other driver’s intoxicated state. At Giddens Law Firm, our goal is always to provide our clients with the excellence of legal services necessary to obtain results. Our experienced Mississippi Motorcycle Accident Attorneys will diligently pursue all claims and seek to maximize your recovery. For a free case analysis, call us today at (601) 355-2022. When a car or other type of vehicle collides with a motorcycle, serious injury and/or death are likely to result. The direction from which the impacting vehicle is moving also affects the likelihood of fatality. For example, rear-end motorcycle accidents frequently result in rider fatality. Motorcycle riders and their passengers do not have the protection that drivers and passengers who are enclosed in vehicles do. Because of this, the impact of a vehicle hitting a motorcycle often crushes the rider and their passenger, if they have one, or sends them airborne. Because rear-end collisions are so often deadly, both drivers and riders must learn how to share the roads safely. Understanding how rear-end collisions between vehicles and motorcycles occur is an important part of understanding how to prevent or avoid them. There are two ways in which most rear-end motorcycle accidents happen. Either the rider is stopped at a traffic light or for some other reason, and the vehicle strikes them from behind, or the motorcycle collides with the rear end of the vehicle after the vehicle stops suddenly. 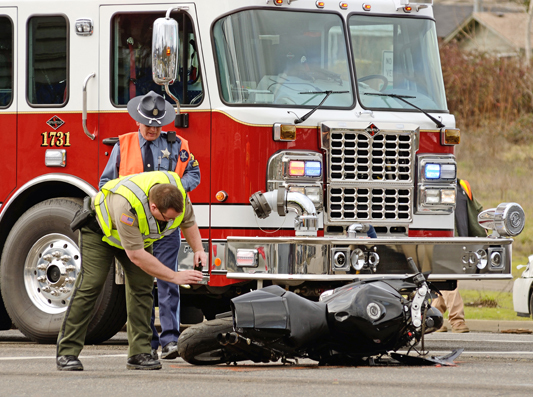 Both types of collision often result in the rider being ejected from his or her bike. A rider can collide with moving or fixed objects as they fly through the air, and when they hit the ground, they do so with tremendous force. Unfortunately, airborne riders also sometimes land in the path of moving vehicles. Many motorcycle accidents can be prevented. Drivers can reduce the risk of hitting a motorcycle by looking twice in either direction before entering an intersection, and by checking side and rearview mirrors when changing lanes and navigating on and off ramps. Both riders and drivers can reduce accident risk by using turn signals to enable others on the road to anticipate their movements. Accidents can also be prevented by giving other vehicles, including and especially motorcycles, enough space. When there is adequate space between vehicles of any type, drivers and riders have a chance to respond to the movements of vehicles around them. What many drivers may not realize is that motorcycles need at least twice as much space as other types of vehicles because of the way that they slow down and stop. If you have been injured or someone that you love has been killed in a motorcycle accident, you may have many questions on your mind. The Mississippi Motorcycle Accident Attorneys of the Giddens Law Firm, P.A. may be able to to help you. Giddens Law Firm, P.A. has built an exceptional reputation throughout the state of Mississippi for relentless pre-trial preparation, case investigation, and use of the latest technologies resulting in many significant jury awards and verdicts. Unlike many law firms, Giddens Law Firm, P.A. limit their legal representation to only a few serious personal injury cases and death claims per year. This is enables their legal experts to focus the most time and resources on each case in order to yield the best possible results for their clients.